Every morning, the fine folks at Sports Radio Interviews sift through the a.m. drive-time chatter to bring you the best interviews with coaches, players, and personalities across the sports landscape. 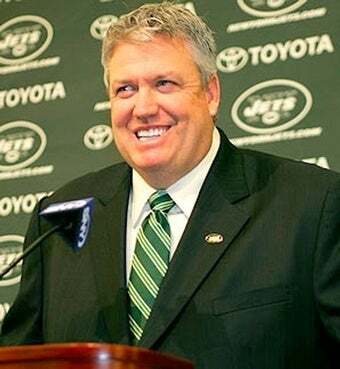 Today: J-E-T-S, Jets, Jets, Jets head coach Rex Ryan. The Jets were a pleasant surprise last year, but after a strong offseason, they're poised to be among the best teams in the league. Rex Ryan stopped by Fox Sports Radio with Hartman and Friends to talk about what the real reasoning is behind being on "Hard Knocks," Darrelle Revis's holdout and his "Super Bowl-or-Bust mentality." "I do [welcome it]. We have nothing to hide. Our goal is to win a Super Bowl. That's the only goal we have. We had the same thing last year. The way the game is, everybody has the same amount of money, so how can you tell your fans, ‘Well, just give us two or three years?' Who's going to buy into that and why would you buy into it. If Team A is spending this much and Team B is spending this, there's no way in heck. If you have any confidence in yourself and the people in your organization you'd have the same prediction, the same goal that I have, and that's to win the Super Bowl." "With HBO and all that, one of our things that we talked about is that we want to have an environment that every player in the National Football League, we want to have wanting to play for the Jets. And we feel the same way about coaches. We feel that this is an opportunity for us to show off a little bit." "First off, it starts with that huge chip on his shoulder that he's going to have. I think it's great that, you can kind of beat around ‘Oh no, no, no, I don't really have one.' Bull. Yes he does. So does Jason Taylor, so does Santonio Holmes, all these guys. … We took some of the premier players in the history of this game and added them to our team. The beauty of it is they have that chip on their shoulder, so we're going to get everything they've got." "We have a ground-and-pound mentality here, a philosophy. But we also have an all-weather philosophy. That's one of our things, to have an all-weather offense. I think this team, with the type of players we have, will we throw it more? I think absolutely we will … but I still want to run the football." "Right now, nothing new to report but I believe Darrelle will be in this lineup and I hope he [is]. But if he doesn't, we've still got enough weapons that we're going to be one of the best defenses in the league, if not the best, again. We were able to trade for Antonio Cromartie and all he's done so far is, every day he's had two or three interceptions. … Hopefully we get Darrelle out there and let's see what you can do in that passing game now." "Don't hold your breath. I said a long time ago I'm going to be true to myself. I know what a blessing it is to get this opportunity. There's only 32 of these jobs and I was fortunate enough to get one, but I was going to be true to myself. I wasn't just going to play it the old somebody else or what everybody thinks the coach should say. That's not who I am. I got here because of being pretty good at what we do … and I'll be darned if I'm not going to be myself."